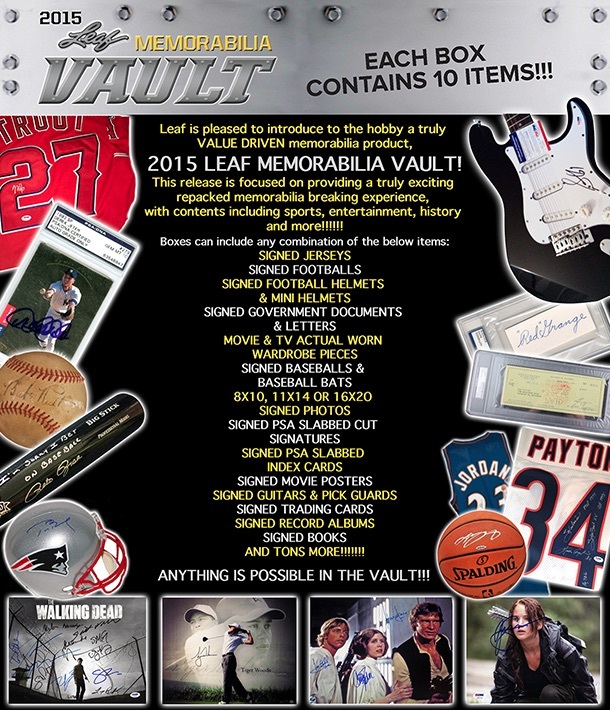 2015 Leaf Memorabilia Vault includes an eclectic mix of items in a repackaged format. The premium product yields ten memorabilia pieces per box. Not just limited to one sport, Leaf Memorabilia Vault touches on many themes, including athletics, entertainment and history. Like all of the memorabilia products from Leaf, the exact options within each box are not known until opened but all boxes will include ten items from a wide-ranging checklist. As noted by Leaf, "Anything is possible in the Vault!" Boasting a large quantity of signed memorabilia, a snapshot of the many choices can be seen below. Premium repacked products are gaining traction in the hobby and Leaf already features multiple releases. This includes several cut signature options as well as signed baseballs, bats, helmets, jerseys and more. However, Leaf Memorabilia Vault is on a different level than most based on the four-figure price tag. Owen Hart Autograph in 1995 WWF Magazine PSA DNA Authenticated. Leaf Vault is impressive. It gives range (multi-sport, entertainment, historical). Normally has 1-3 “Great Hits” in the 10, but the other 7 aren’t necessarily bad. Works best in a random draft format for breaking. Lot’s of stuff for PC collections here. Really nice seeing MOST of the people in there picking with their hearts vs. with what eBay claims has the most value. Highly recommend, for the price point there is nothing better!